To create a new user simply click the “New” button. The “Add/Edit User” screen will be displayed. Editing a user uses the same screen so all you have to do is select the user you want to edit and either double click to open the “Add/Edit User” screen or click on the Edit button of the toolbar. Fill in all required fields and when you are happy with your inputs click on the “Save” button to save your changes. Depending on the name of the new user you may have to scroll to see it as ATMS™ will always order the user list in alphanumeric order. In this tab administrators can assign users to existing teams in ATMS™. Back when we looked at the Organisation section of ATMS™ we saw that when creating a new team or editing an existing one an administrator could select several users per team as a useful way of grouping users. The same principle applies here too. 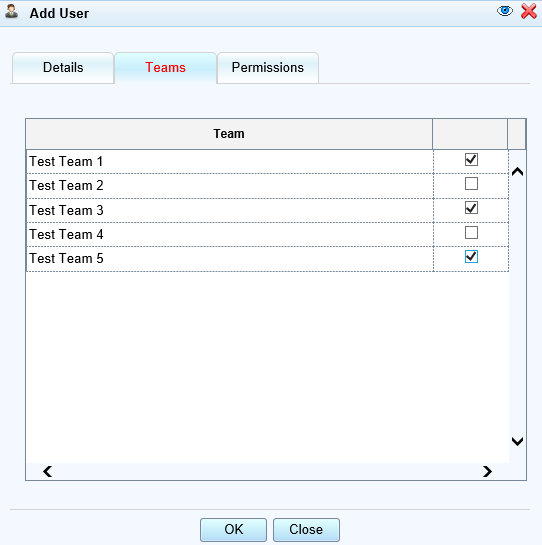 An administrator can select several teams to which to add a newly created or existing user to. This tab allows the administrators to define some of the key ATMS™ user rights which are described below. This option is used to set the user as system administrator. If selected, it allows the user to have full control over the ATMS™ system. Generally, a single point of contact within the organisation is set as system administrator. This option is used to set the user as action administrator. If selected, it allows the user to have full control over the actions in the ATMS™ system. If selected, users can be given the authority to create actions. If a user is not given this permission, they will still be able to receive actions and complete them, but they will not be able to create new actions. If selected, users can be given the authority to upload/import actions. If a user is not given this permission, they will still be able to receive actions and complete them, but they will not be able to upload/import new actions. If selected, users can be given the authority to change the status of actions. If a user is not given this permission, they will still be able to receive actions and complete them, but they will not be able to change their status. Can Change Strategic Review Date. If selected, users can be given the authority to change the Strategic Review Date of actions. If a user is not given this permission, they will still be able to receive actions and complete them, but they will not be able to change their Strategic Review Date. This will only apply to Projects that use the “Strategic Reviewer” roles. If selected, users can be given the authority to change the Due Date of actions. If a user is not given this permission, they will still be able to receive actions and complete them, but they will not be able to change their Due Date. If selected, users can be given the authority to change the Strategy Creator of actions. If a user is not given this permission, they will still be able to receive actions and complete them, but they will not be able to change their Strategy Creator. This will only apply to Projects that use the “Strategic Reviewer” roles and do not skip the “Strategic Review” stage of the approval workflow. If selected, users can be given the authority to change the owner of actions. If a user is not given this permission, they will still be able to receive actions and complete them, but they will not be able to change their owner. If selected, users can be given the authority to change the reviewers of actions. If a user is not given this permission, they will still be able to receive actions and complete them, but they will not be able to change their reviewers. If selected, users can be given the authority to mark actions as “On Hold”. On hold actions are not deleted from the system but they cannot be put through the approval workflow until they have been marked as not on hold. If a user is not given this permission, they will still be able to receive actions and complete them, but they will not be able to mark them as On Hold. Can Edit Custom Report Template. If selected, this will allow the user to save and edit report templates in the custom report window. Without this permission set, they can still utilise existing report templates to generate reports. Can Create and Edit Projects. There may be a need for certain users to have some administrative rights over ATMS™ to create and edit Projects in the Projects Tab but not be full administrators of the system. In this case this checkbox should be selected. Can Create and Edit Matrices. If selected, this will allow the user to save and edit matrices in the Matrix tab. This is an extra administrative Tab that not all projects will utilise. Please contact Pisys Support if you need this feature enabled. Can Create and Edit Teams. 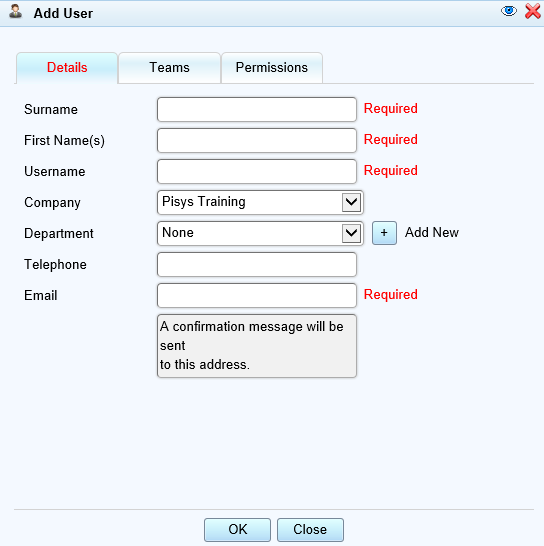 There may be a need for certain users to have some administrative rights over ATMS™ to create and edit Teams in the Organisation Tab but not be full administrators of the system. In this case this checkbox should be selected. This permission works with the create/edit projects permission above to restrict the user to their own company’s projects. If selected, users will only be able to see the actions which require their attention, in other words actions which are outstanding on them. If selected, users will only be able to see the actions in which they are involved as creator, owner, Reviewer 1, Reviewer 2, Strategic Reviewer 1, approver, or final approver etc. Lock ‘Actions Involving My Company’. If selected, users will only be able to see the actions in which at least one member of their company is involved as creator, owner, Reviewer 1, Reviewer 2, Strategic Reviewer 1, approver, or final approver etc. This entry was posted in 3.9 - Users Tab, 3.9.1 - Create a new User by Kiki. Bookmark the permalink.